Oh the waiting game! I’m writing this while 38 weeks pregnant–not dilated, not effaced, no contractions, nothing. This is my third baby. The first two had to be evicted or they might have stayed in there forever (at least that’s how it felt at the time). I know not all women go all the way to the due date or beyond, but for those who do, we share this in common: the last month of pregnancy is tough! You feel huge, uncomfortable, and probably a little (or a lot) impatient. Time seems to move in slow motion. The aches increase by the day. It feels impossible to make plans. You’re more than eager to meet your little kicker on the outside. I’m experiencing this “waiting game” that is the last month of pregnancy for the third time right now. I can’t wait to meet my little girl! Her two big brothers can’t wait to meet her (at least that’s what I’m telling myself). But after doing this a couple times, I have to say that it’s a little easier this time around. Here are some tips that can hopefully help you make the most of the last month. This is for those of you who are actually sleeping. I wish I could enjoy sleep, but that is not happening. I’m pretty sure I did the first two pregnancies, though. I don’t really remember. But let’s be honest—any sleep is better than newborn stage sleep. Take advantage of it while you can. And if you don’t have this magical pillow, GO BUY IT NOW. Even though you only have a month (give or take) to go, it’s worth every penny for however many nights you get to cuddle with this thing. Especially if you’re due toward the end of the month, these things can be brutal! I’ve been due on 12/21, 7/24, and now I’m due 1/21. With each pregnancy I’ve been a visitor on a forum where EVERYONE (it feels like) has already had their baby about a month before I’m even due—or they’re having it today—right now. Or they’re having contractions or losing their mucus plug or their water is breaking—RIGHT NOW. If those things are not happening to you, it is just not encouraging to read about it! Put your feet up and relax! Enjoy it while you can. Really! Making a birthing plan is certainly a good thing to do (or even just thinking through how you’d like it to go), but prepare yourself for it not going exactly like you plan. Maybe it will, which would be awesome! But in case things don’t go exactly how you picture, it’s best to keep an open mind as you keep your eye on the prize–delivering your baby! Oh this is so hard! Listen to your body and call your doctor if you’re ever unsure. But try not to obsess about every possible sign. This is definitely easier said than done. The last month of pregnancy is a great month for stocking your freezer with food and/or giving your house one more good cleaning. You can read about the best newborn freezer meals to make here. You don’t want to overdo it, so be mindful of your swollen feet and aching back and REST. I’m preaching to the choir right now because my to-do list can very easily make me keep going when I shouldn’t. It’s hard but at this stage it’s really important to rest when you need to. Maybe your water will break–maybe contractions will start–maybe you’ll go late and be induced–maybe you’ll need a c-section. There are so many ways labor and delivery can unfold. I think it’s kind of exciting. Both of my labors so far have included very unexpected details. In hindsight I wish I had “rolled with it” a little better than I did. You can read about my birth stories here and here. Update: You can read about all 4 of my birth stories here. We’ve all heard of that woman whose water broke at 38 weeks, progressed from 0 cm to 10 cm in 1 hour with no epidural, and after 2 pushes-out popped their little one. As hard as it is, it just doesn’t help to compare symptoms or how things unfold. Your story is your story. It will be unique and special, whatever the details might be. When I was pregnant with my first son, I stopped working 10 days before my due date and had absolutely nothing to do during those 10 days (which turned into 19 days). Oh wow did time stand still. The days dragged on forever. In hindsight, I should have had some non-urgent projects or tasks to keep me busy, like doing a thorough house cleaning, freezer cooking, visit with friends, shopping/stocking up, finishing the nursery, etc. And make sure not to overdo it and relax when you need to! If your day comes and goes and your doctor is ok with it, you are just fine. That date really is just an estimate. Baby will come when he or she is ready (or when your doctor says it’s time). Update: Yup, these are still true. 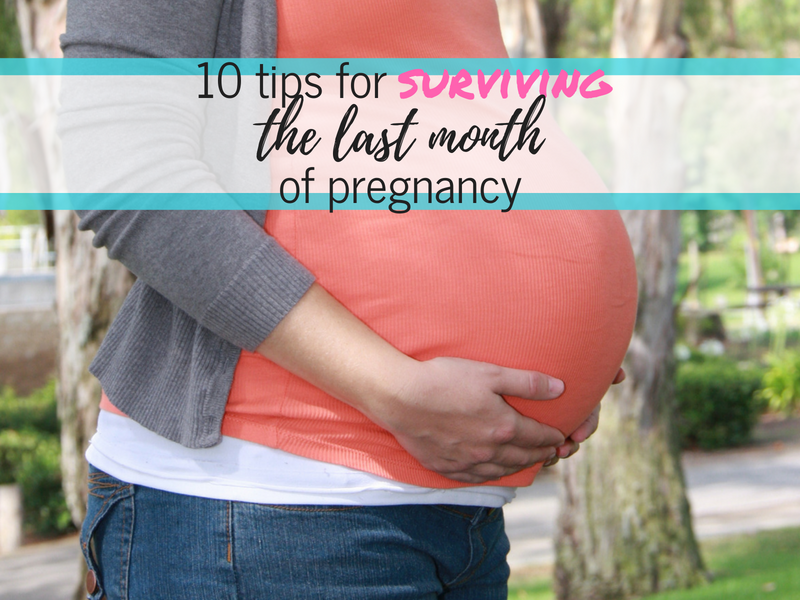 Now that I’ve had four babies–two after being induced and two on their due dates–I’d still recommend these 10 tips for surviving the last month of pregnancy to any expecting mama–along with a resounding You Got This, Mama! I’d love to hear from you! Do you have experience with the home stretch? How do you cope? Kimberly is a busy coffee-loving, homeschooling, bum-wiping, taxi-driving mom to three boys and a girl. In her non-existent free time she loves to read, is totally hooked on crocheting (get it? ), and loves eating at restaurants with her family so she doesn't have to cook or clean up. Sign up to receive a monthly newsletter with all the latest information! 32 weeks here. The time is dragging on, and on. With my first I got impatient and scheduled an induction the Monday following due date, then just happened to go into labor Saturday, happened to have him right on his due date. I doubt I’ll make it to #2’s due date, this pregnancy and my 1st are like night and day. I’m only 28 weeks pregnant with twins and I am bigger than most women about to deliver- each twin is in the 80th percentile for singleton size. My biggest problem is fatigue. I am still working fulltime, and I really need more rest than I am getting. The only days that I feel good are weekend days. I so love sleeping in. I already need someone to cook freezer meals for me. Eep. I hope you’re able to find the rest you need! That’s an amazing size for twins. My sis and I were a total of 5 pounds when we were born. Sounds like you have some healthy babies! All the best. It’s tough in the 3rd trimester! Do you have a pregnancy pillow? I had much better sleep once I started using them. I am 35 weeks along with #4 and already feeling “cooked”! Congrats on baby #4! Good luck with delivery! These are great tips! Both my babies tried to come too early so I was on the opposite end of this problem! My BF is going to have a baby this year so I’ll pin this for her because I’m sure she’ll need to read this! Thanks for pinning, Carrie. Babies sure have a their own timetable, don’t they? 🙂 This baby decided to come on her due date (1/21) which totally surprised me. I have a good friend who is in her last month and I know she is so ready. Oh I needed this thank you. I am due on 2/21 with my second and part of me is ready for her now! The other part is really trying to sleep, relax, and finish all that stuff that I know I won’t have time for when she gets here. Best of luck to you! These are great! The last month is seriously the worst. I hope these tips help lots of people! I certainly will be coming back for my next baby! Thanks for visiting! I really appreciate your comment. Great tips! Thanks for sharing at the DBB! These are some great tips, I know with my little girl I drove myself crazy waiting for her to come. I worried about every little thing ( she was my first though). Some of these would have definitely been helpful! Thanks for sharing on the DBB! Yes it is SO easy to go crazy…the longer I wait the harder it is. 🙂 My little girl seems to be quite content. Oh well–they come when they are ready! Don't wait for a do-over. Reset your bad mom day now!